Last Sunday was the Tony Awards so this week I thought I'd share my favourite looks from the Red Carpet. I feel like the Tony's are a little less formal than other awards shows and the red carpet is a bit more relaxed and a bit more wearable if that makes any sense! I love this dress. I'm a big fan of monochromatic looks and I love how this is almost tow dresses in one. The geometric pattern on the skirt is just so unlike anything I've seen in a while as well so I think the fact it is so unusual but wearable sold me. I'll admit I hadn't heard of Foster before but oh how I love this dress. It reminds me of my senior prom dress which was also fuchsia with a full skirt. I love that she kept the rest of her look very simple to counteract the super bright pink. I can not find anywhere who Bloom was wearing but I loves this blue and black tux. It's a new twist on a classic and in my head I'm imagining NotBlondHusband being able to pull off this colour combination, too. Don't forget I've got a fab giveaway to win a Hotter Handbag! It's open to US and UK residents and closes June 16th. Thanks for this fun red carpet event!!! Unfortunately I missed the Tony awards but usually I love watching the red carpet at any award show, I love the first dress too, very chic :) and thanks for the linkup opportunity! Love Caroline Herrera's skirt/bottom of her dress! Sutton looks wonderful. What a gorgeous shade of Pink! Oh I love Orlando Bloom! I didn't watch the Tony Awards but you've picked some great looks here. I watched the beginning of the Tonys but got exhausted with Hugh Jackman. Whew! 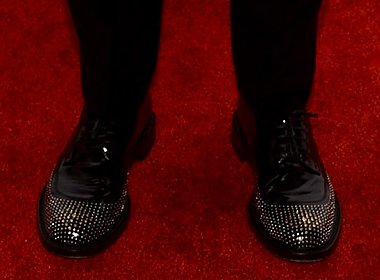 Then I just stopped watching, my bad :( Zachary's shoes are blinged out though, could give a lot of guys attending the MTV awards a run for their money. Thanks for hosting Melaina and enjoy the rest of the week! Orlando Bloom is such a dish! I always love a good red carpet! Hope you are doing/feeling well. Zachary Quinto's tux is horrendous but those shoes, they are just fab! I love that you talk about the guys as well as the ladies. I think Orlando looks fab! Thanks for hosting lovely! Couldn't agree with you more - Zachary Quinto's shoes are basically the coolest things ever! Love Zachary Quinto he always looks like a 10! Love that gorgeous Reem Acra dress on Sutton! I love both Beth's and Sutton's dresses!! They are gorgeous!! The main reason I watch any awards show is just to see the fashion! I love it!! That hot pink dress is to-die-for! What I Wore Wednesday: Hotter Handbag Giveaway!